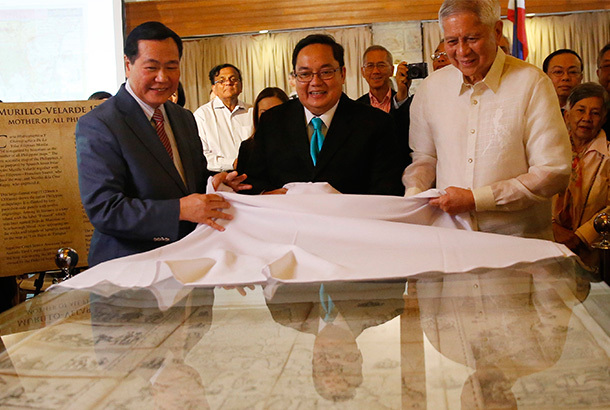 MANILA, Philippines — Supreme Court Senior Associate Justice Antonio Carpio launched a book on Thursday that questions China’s historic claims to most of the South China Sea and said he will distribute it online to try to overcome China’s censorship and reach its people. Carpio said his e-book can be downloaded for free in English now and will be made available online later in Mandarin, Vietnamese, Bahasa, Japanese and Spanish to help more people understand the basis of the Philippines’ stand against China’s territorial claims. Carpio said public opinion, including in China, can help pressure Beijing to comply with an arbitration ruling last year that invalidated China’s historic claims based on a 1982 maritime treaty. Carpio helped prepare the arbitration case, which the Philippines largely won. China has dismissed the ruling and continued to develop seven artificial islands in the South China Sea’s Spratly archipelago. China’s construction of the islands on disputed reefs has alarmed rival claimants and the United States. “I believe that like all other people of the world, the Chinese people are inherently good but their government has drilled into their minds that they own the South China Sea since 2000 years ago. This is, of course, utterly false and the world will never accept this,” he said. Chinese Embassy officials were not immediately available for comment. In the book, titled “The South China Sea Dispute: Philippine Sovereign Rights and Jurisdiction in the West Philippine Sea,” Carpio uses old maps, photographs, excerpts from the arbitration ruling, Chinese government statements and documents to question the validity of China’s claims. Carpio’s studies on the South China Sea disputes are not part of his work on the Supreme Court. He said he asked the court’s permission in 2015 to give lectures in 17 countries to explain the territorial conflicts, which many fear could become Asia’s next flashpoint. Carpio warns in the book that China may be planning to build more island outposts at Luconia Shoal off Malaysia and Scarborough Shoal off the northwestern Philippines to protect its economic and security interests in the region. If it constructs an island base at Scarborough, China would have enough radar coverage of the South China Sea to be able to impose an air defense identification zone similar to what it did a few years ago in the East Sea in a region where it has territorial rifts with Japan, he said. China and the Philippines, along with Brunei, Malaysia, Vietnam and Taiwan have overlapping claims to parts or all of the South China Sea that straddle busy sea lanes and are believed to be atop undersea deposits of oil and gas.